My name is Stevie Brown, I grew up in Idaho, but currently go back and forth between ID, MT, CO, and AZ. Growing up, I was involved with Jr Rodeo, HS Rodeo, a few local barrel racing associations, and now pro rodeo and train futurity horses. I also enjoy breakaway roping and team roping. I had plans of going to college right after I graduated from my online HS, but things fell through at the last minute, and I took that as an opportunity to go to Arizona to spend the winter and Derby a horse I had coming up, Hoodiny. In the end of February Hoodiny came up with a suspensory issue where the fibers had began to separate in his front leg. 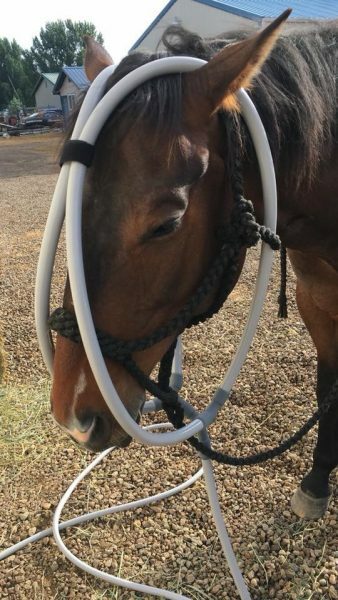 We couldn’t determine the exact cause of it, so I started looking into different types of Equine therapies and ways to avoid it happening again, and that’s when I first started learning about PEMF Therapy. Kathy Schaffer with Schaffer PEMF Therapy & Equine Services out of Broadus, MT, really helped me learn a lot with Pulse Therapy. She got me started, helped me choose a machine that best fit me, and also helped me begin working on client’s horses. Pulsed electromagnetic field therapy (PEMF) creates a pulsing electromagnetic field which restores health at a cellular level by stimulating the cell metabolism. As the electromagnetic field pulses, the cell membrane is gently pulled; on the off phase of the pulse, the cell membrane is relaxed. With this method the cell membrane becomes more permeable, and is able to release waste, toxins, inflammation, and receive oxygen and nutrients. PEMF treatments are non-invasive, no sensation is needed, no drugs, and no side effects. 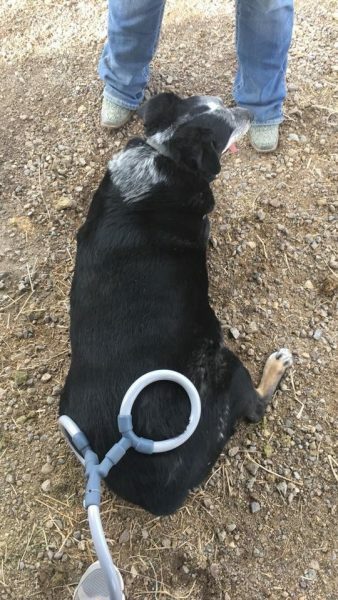 PEMF has the ability to show where an animal is sore, while providing relief eat the same time. Results are usually noticeable after the first treatment. What conditions can be improved with PEMF? Most people/animals show signs of relief immediately following a session. I personally recommend at least three sessions of PEMF unless there is a specific goal with the client; ex. Injury or wound healing. I believe PEMF is a regular therapy, especially when it comes to Equine athletes. I do my personal horses about once every 2-3 weeks depending on how much they are getting hauled. Service cost can differ depending on the overall goal. For horses, I start full body sessions at $100, body only at $80, legs only at $40 and injury’s at $150. I also sell packages, which lower the cost of each individual session. Sessions usually take 30 minutes to 90 minutes to complete. For people and smaller pets, I charge off of time. Starting at 15 minutes for $30, 30 minutes for $60, and 60 minutes for $90 and so on. There are packages for these as well. How long after the session can a horse be used? There is no down time with PEMF! I have personal horses that I Pulse prior to running them as part of there warmup or to get them relaxed and focused. What are typical animal reactions? Usually an animal reaction will occur 60-90 seconds into a session. With horses, they begin to relax and stand still (if they are normally wigglers), they will show a soft eye, and yawn. With pets, I’ve had dogs, for example, fall asleep during a session. I’ve also had one get up from a session where I was pulsing his hip, turn around and lay back down with the opposite hip on the pulse rings. I’ve had very hyper dogs, that can show some aggression, completely freeze and relax while getting a PEMF session. Animal reactions can differ from animal to animal, but all show a relaxed mood and some sign of relief during the sessions. One thing about my pulse machine is that it is completely mobile! I love this aspect of my job because that gives me the opportunity to work and travel! I currently offer sessions in southwestern Montana, Southern Idaho, northwestern Colorado, and all parts of Utah. After the 1st of October I will be offering sessions in Arizona around Wickenburg, Cave Creek, and Buckeye! My schedule is very flexible and I travel quite a bit, so if people are interested in getting a session, I am usually able to meet with them fairly easily! 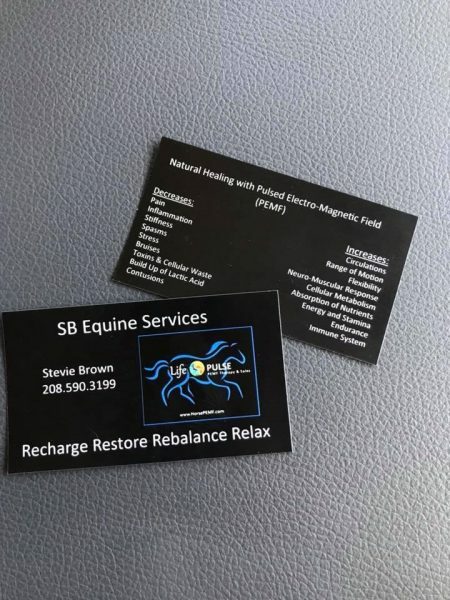 Thank you so much for asking me to share my knowledge of PEMF therapy with you and be sure to follow me on Facebook at SB Equine Services!